Remember that story I told you about skiing? I told you how much I love it, and how, after I discovered the power of getting a great mentor and following a proven path, I was flying down bigger mountains than ever, seeing sights I’d never seen, and having the time of my life. Well, this story is nothing like that one. Recently, my husband Dave and I went for a ride. I have an awesome SCOTT road bike, and typically, we love biking together. On this particular day, we decided to ride a beautiful greenway along a river near our house. But on this trip, it felt like I was working way harder than normal. It was hard to keep up with Dave, my heart was pounding, and I felt the beginnings of heat exhaustion. All I could focus on was the feeling that I wasn’t good enough. My inner arch-nemesis, Perfect Portia, was screaming that my bike-riding skills were way short of her expectations. And all the negative chatter and self-criticism kept me from enjoying the beautiful scenery. Then we discovered that something wasn’t right about my gears. They were shifting properly, but they were making a funny sound, and were not consistent. Next, we realized my front brakes weren’t functioning like they should be. At the end of the trip, we dropped the bike off at a local shop. After they inspected it, they called to give us an update: my chain and gears needed an adjustment, my front brake was rubbing the tire, and I had a slow leak in my front tire. All of these issues contributed to making my ride much harder than it needed to be. And, despite all the criticism, the lack of enjoyment, and the self-blame—it wasn’t my “fault.” It was my equipment’s fault. Last weekend, we picked up my bike after a full tune-up, and BAM! We had a super-fun, enjoyable, easier ride. In fact, we went the fastest I’ve ever gone. Because my equipment was faulty, I was working way harder than normal—and I wasn’t keeping up. I was frustrated and disheartened. 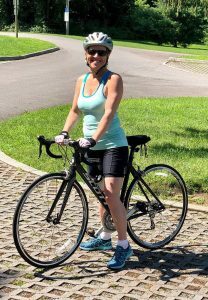 Yet, a simple solution—a quick tune-up—solved my problem and allowed me to enjoy the next ride and make greater progress! In business, the most enjoyable path is often found with the right equipment. In this case, that’s an integrated back end, rather than a bunch of systems and technology piecemealed together. When you’re incorporating multiple technologies, you’re working harder than you have to—and you’re inefficient. Frustration ensues, because you don’t get the results you want, in terms of generating leads, converting clients, coaching those clients, and of course, making money! The good news is that you CAN give your business a tune-up and enjoy the ride as it functions at optimal levels! If you’d like to learn more about how, I’d like to invite you to download a complimentary resource I designed to help you set up the right equipment to ensure your business runs smoothly. 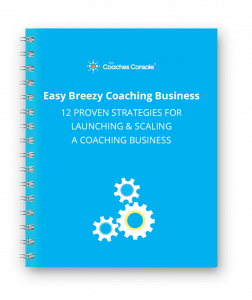 It’s called 12 Proven Strategies for Launching & Scaling a Coaching Business Now, and you can download it here.